Cherry Chocolate Overnight Oats. 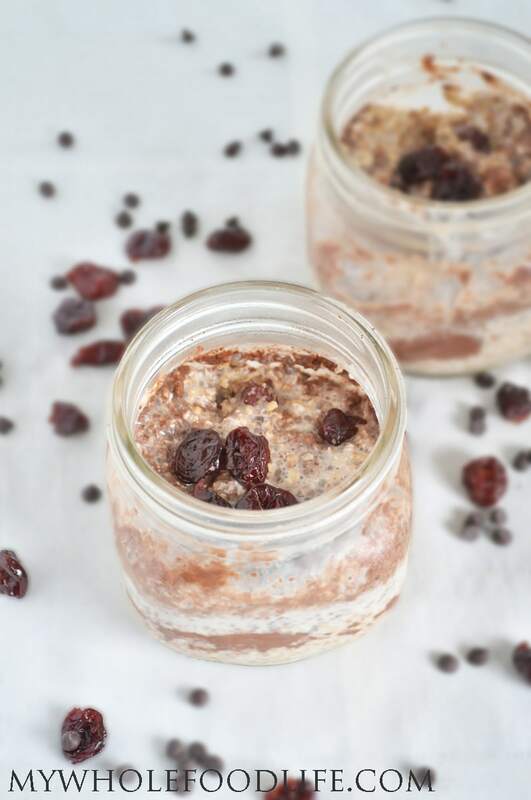 Cherries and chocolate go so well together and that is why I made these cherry chocolate vegan overnight oats. If you have been following me for a while, you know I love overnight oats. Overnight oats are some of the easiest breakfasts you will ever make. Overnight oats are also known as oats in a jar. There is no cooking involved and it’s a breakfast that will keep you full into lunch. This cherry chocolate overnight oats recipe is perfect for all you chocolate lovers. It’s like eating dessert for breakfast! This easy overnight oats recipe is vegan and gluten free. You can eat it cold, or heat it up in the morning. I personally love making these with steel cut oats and eating them cold. It reminds me of the boxed cereal that I used to eat. I used dried cherries in my recipe, but you can use fresh as well. I hope you enjoy. Place all the ingredients in a jar, mix well and store in the fridge overnight. I like my oatmeal unsweetened. If you like your oatmeal a little on the sweet side, feel free to add in some dates or maple syrup. You can make 5 of these up at a time. If you plan on using fresh fruit, don't add that until right before you eat it. I use 12 oz mason jars for mine, but any container will work. Enjoy! These look great! No maple syrup or dates in this one? Thanks for another great recipe!! I didn't add them, but feel free to if you like. I have been eating my oatmeal without sweetener lately. This sounds delicious! I love cherries and chocolate together, so must try this one. All of them are so good, it is hard to pick one as a favorite. I just alternate and make with what I have the most of. So good for breakfast!! Thank you for all the wonderful, healthy recipes!! You're welcome Nancy! I hope you enjoy this one as well! I've tried the steel cut oats before, but they don't seem to soften, at all. They seem to remain exactly as I put them into the jar, firm and harder to eat. Am I doing something wrong? On the first day they still retain a crunch. I like that. It reminds me of cereal. If you want a softer oatmeal, you can try using rolled oats. To be honest, I did not like this at first. It was really bitter. Perhaps it's the kind of cocoa powder I used. But when I added a little pure maple syrup (and a squirt of Nestle chocolate syrup, desperate to get my son to at least have a bite), it was really good. In fact, my 3-year-old said, "This is the goodest thing I ever had for breakfast!" Now I've gotta work on getting him to try some of your other overnight oatmeal recipes. The apple cinnamon is to die for!! Did you use cacao instead of cocoa? That would make it on the bitter side. Glad you were able to alter it and like it anyway! Thank you! It was my breakfast the last 2 days. So yummy! So easy ! Exactly what I was looking for! Making them with some fresh raspberries instead of cherries and adding some maple syrup. Oh yum! Raspberries would be great too! Just add them in the morning. I love your OO recipes so I just made 5 jars of this recipe for my upcoming breakfast at work. I'm thinkingod adding maybe a little unsweetened coconut flakes in one of them and a splash of maple syrup in the rest for a touch of sweetener. Looking forward to Monday morning at work now! Would you have to have the chia seeds in? I have so many allergies and something in that makes me ill. Just wondering if need in it if there is a substitute ? You can probably omit them, but use less milk. The chia seeds help absorb some of the milk. I am not sure about how much oat bran you would need. I have never used it before. Quinoa will not expand like the oats do. I tried once and it didn't work. However, I do have a slow cooker quinoa recipe that is delicious. https://mywholefoodlife.com/2014/01/13/slow-cooker-breakfast-quinoa/ I also have several flavors of chia pudding if you ever want to try it. You can use either in any recipes. I just use what I have on hand mostly. So that is why it can vary from recipe to recipe.